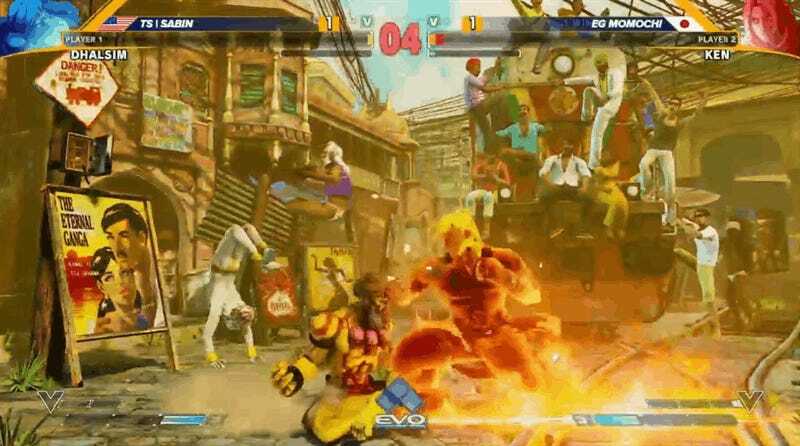 EVO 2016 is almost over, fighting game fans, but a lot can happen in the final moments, like a pixel-sliver win or tournament finals for Mortal Kombat X, Ultimate Marvel Vs. Capcom 3, Guild Gear Xrd: Revelator, Super Smash Bros. Melee and Street Fighter V.
The GIF above is from one of those dramatic matches one hopes to see while watching top-tier fighting game competitors duke it out. Sabin and 2015 champion Momochi trade blows in one of the closest matches ever. Check out the match below. Now we’re down to five finals, none of which those two will be appearing in. Sorry. Just the main events today, which means all you need is a single Twitch channel to watch them on, which we’ll embed here for your convenience.